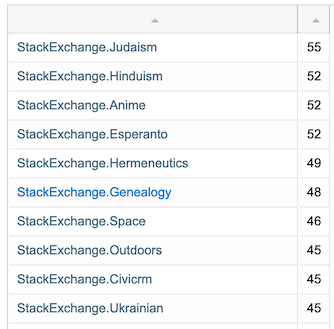 On which Stack Exchange sites are the set of people answering most similar to the set of people asking? Does Stack Exchange collect, or can calculate, any metrics which would give an indication of which site an individual user is likely to both ask and answer questions? I ask because in the brief time I've been perusing the various sites, it seems with a few notable exceptions (e.g. Puzzling) that there isn't much overlap between the askers and the answerers. I've constructed a SEDE query which compares the top X askers (by # of questions asked) to the top X answerers (by # of answers posted). Running it with X = 100 declares Mi Yodeya as the winner with a 55% overlap, followed by three sites with 52%. The query excludes child meta sites; those generally have a much larger overlap than main sites, as can be seen in a previous revision of the query. The outcome will certainly depend on the value of X; if you increase it to 1000, Meta Stack Exchange leads the board with 59%.